Elderflower is abundant in the summer in the Irish countryside. At EIPIC, we pick lots of it in season and then dry or pickle it for the autumn months. You could also make your own cordial which is great for adding to sparkling water or even Prosecco. It’s almost tropical floral flavour works really well with late summer and autumn fruits like apples and pears. In this Pear and Elderflower Custard Tart Recip we infuse the flavour into the milk to make a rich custard. We serve the pears warm and the granita cold so when eating you get 2 different flavour experiences. On a cold day you could just top with a nice crumble mixture with some almonds. Also this recipe works really well with apples too. 1. Boil the butter and honey together. 2. Cut the pastry into strips at the widest part of the sheet. 3. Take a strip of pastry and brush with the honey butter, layer another on top brush again. 4. Wrap around a tart ring or case. 5. Bake in a hot oven 180˚ for 8 – 10 mins until golden brown. 1. Peel and chop the pears into cubes. 2. In a saucepan heat the caster sugar until it begins to turn an amber coloured caramel. 3. Add the butter, juice, cream, salt and vanilla to make a butterscotch style sauce, bring to the boil and add the pears. 4. Bring the heat up again, stirring occasionally until the pears are coated in caramel and remove from the heat. 1. In a saucepan heat the milk and cream with the elderflower until just below boiling. 2. In a bowl whisk the eggs and sugar and cornflour. 3. Pour the hot cream mixture on top whisking continuously. 4. Pass the custard mix through a sieve into a saucepan return to the heat and stir the mixture until it begins to thicken. Pour the 2 liquids into a lunchbox style container and freeze solid. 1. 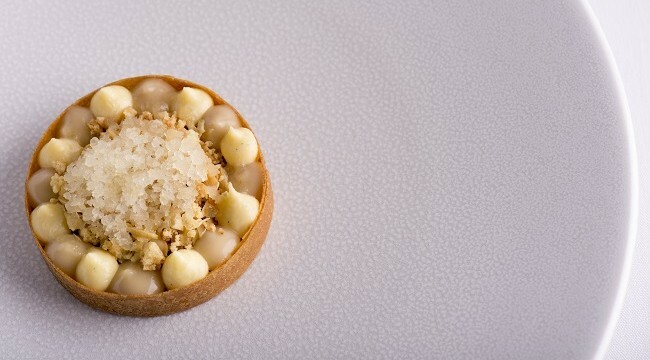 Place the tart cases on a plate. 2. Cover the bottom with the warm pears. 3. Spoon the elderflower custard over the top. 4. Remove the granita from the freezer and scrape with a fork. 5. Cover the tart and serve. 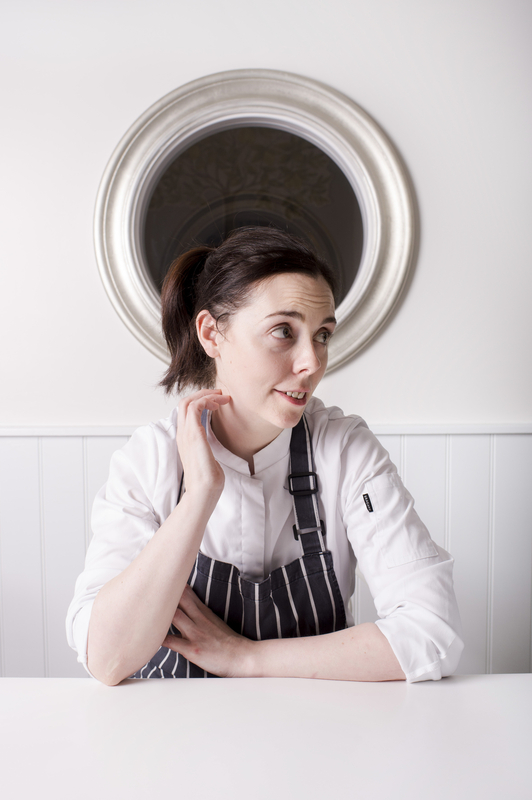 Chef Danni Barry is one of an elite group of female Michelin starred chefs in the UK, and only the second female chef ever in Ireland to gain a star. Growing up on a farm in Mayobridge in the Mourne country in Northern Ireland, Danni Barry’s cooking career began with Michael Deane in 2003, after four years at Deanes Danni travelled to kitchens around the world before taking over the helm at Deanes EIPIC in 2014, where she gained the Michelin Star within just eighteen months of the opening. Danni’s own style is progressive, honest, flavoursome, light, visual, balanced and modern. She credits having an understanding from an early age of where food comes from as having the biggest impact on her style of cooking. This farming background, allied to her training under Michelin starred chefs, has instilled the knowledge and developed the skill Danni shows in her ability to transform the raw ingredients she sources into the EIPIC dishes she creates at Deanes.